educators and clinicians who want to explore diabetes treatment in depth, along with gaining a better understanding of the co-morbidities that are often missed or undertreated. In addition, this set includes a handy pocket size foot exam chart and a guidebook on intensive diabetes management. 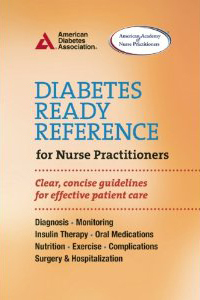 All books are reviewed and published by the American Diabetes Association, and is an excellent bundle for those preparing to take the Board Certification in Advanced Diabetes Management Exam (BC-ADM). Great info at a great price. 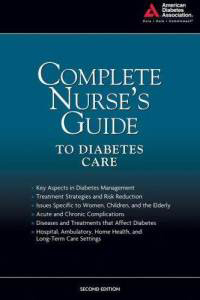 Provides nurses and health care professionals with key aspects of diabetes management, treatment and risk reduction strategies. An excellent resource for those planning to take Board Certification in Advanced DM Management Exam (BC-ADM) or for those interested in expanding knowledge of issues specific to women, children and elderly. 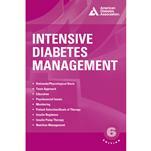 Includes management for type 1, type 2 and more. 2nd Ed 2009, 550 pages. Spiral bound handbook with easy-to-find diabetes care guidelines, protocols, and facts. A practical resource for nurse practitioners and health care professionals to apply in clinical care for type 1, type 2, and gestational diabetes. A helpful study tool for those taking the BC-ADM exam. Published in conjunction with the American Academy of Nurse Practitioners. Spiral Bound, 6″ x 9″ 76 pages. Intensive Diabetes Management through daily insulin injections or an insulin pump requires close collaboration and advanced knowledge of insulin therapy. Intensive Diabetes Management is geared toward the healthcare practitioner who wants to utilize this therapy safely and efffectively. This books offers the information clinicians need to help each patient move toward treatment goals appropriate for their individual skills and medical conditions. For those striving to deliver intensive therapy this is the essential guide. 172 pgs, 6 X 9, 2016. This laminated 6 fold brochure is a compact, but complete pocket chart that lists the major steps in diabetic foot examination. Includes risk classification plus strategies for treating infections in the diabetic foot, foot ulcer classification, indications for different dressings, and a guide for footwear prescription. Also contains foot deformity diagrams and visual instructions for the monofilament test and ABI calculation.